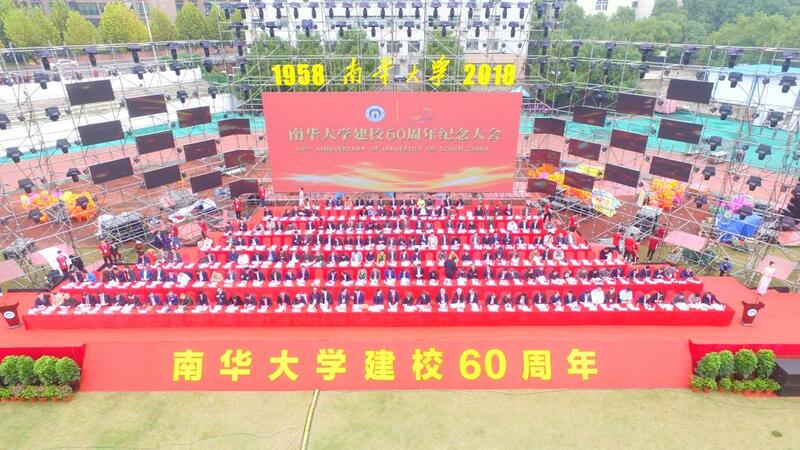 On the morning of October 16, 2018, the Commemoration of the 60th Anniversary of USC was held on Hongxiang campus, the downtown campus. Attending the ceremony were Ms. Li Weiwei, chairperson of Hunan Provincial Political Consultative Conference, Mr. Li Qingtang, vice CEO of China National Nuclear Corporation, Mr. Zheng Jianxin, secretary of Hengyang Committee of CPC, Mr. Deng Qunce, mayor of Henygang, and representatives of academicians, leaders and guests from the all stakeholders. Many universities and organizations sent congratulatory messages. At 10:16 am, the commemoration kicked off in the solemn and majestic national anthem. Mr.Wang Hanqing, chairman of the University Council, presided the commemoration. Mr. Zhang Zhuohua, president of the University, delivered a warm welcome speech. In his openning remarks, the Chairman said that he was proud of the 60 years of history of USC and full of confidence and strength for the bright future of USC. "Standing at the new historical starting point, the University shall study and implement Xi Jinping Thought on Socialism with Chinese Characteristics for a New Era, implement the spirit of the National Education Conference, follow the initiatives of “One C Three Bs”, and “One R Three Cs” * and lay a solid foundation for the improvement of the quality of education and teaching", he said. "The University shall create a good campus culture atmosphere and accelerate the 'Double First-Class' construction, strive to build first-class undergraduate programms and make efforts to build USC into an education and research oriented institution with distinctive features--top-notch in the province, high-ranked in the country and well-known in the world, " he continued. President Zhang Zhuohua extended a warm welcome to the leaders and guests present at the event. He delivered cordial greetings to 250,000 alumni home and abroad and expressed his sincere gratitude to the friends from all walks of life who have long been caring for and supporting the development of School. Reviewing the development history and the achievements of education and teaching of the University in the past 60 years, he pointed out that in the new era, the University would always implement the fundamental tasks of enhancing morality and strive to cultivate more new talents in the era who are to shoulder the responsibility of national rejuvenation. Also addressing the autdienc were Mr. Chen Xiang, Mr. Hu Zhen, alumni representative, deputy chief designer of “Jiaolong” Manned Submersible and General Designer of “Deep-Sea Warrior” Manned Submersible, Mr. Chen Guoqiang, academician of Chinese Academy of Sciences, vice president of Shanghai Jiaotong University, Mr. Zheng Jianxin, cecretary of CPCHengyang Municipal Committee, Mr. Li Qingtang etc. also made key speeches. In their speeches, they highly appreciated the remarkable achievements made by the School in recent years and wished that USC would give full play to its advantages in engineering technology and medical health in order to serve the motherland and the world, enhance the ability of scientific research and social services, and promote cultural heritage and innovation, strengthen the opening up of education, increase the level of internationalization, and actively participate in building a community with shared future for mankind. At 7:30 pm, the University held a wonderful anniversary gala evening with guests,alumni, teachers and students. One C Three Bs”, and “One R Three Cs : Consolidate the foundation of the best and brightest staff to Bolster the talent nurturing, to Bolster the research, and to Bolster the service for the society, and to strengthen the Construction of undergraduates programs, the Construction of disciplines, and the Construction of innovation capacity by the Route of Connotative development.